I’m standing in a Krispy Kreme shop. I’ve already received my full order. But I can’t leave. I’m mesmerized by the conveyor belt of donuts behind the counter. They’re rolling up out of some magical donut paradise, appearing through a waterfall of frosting glaze Willy Wonka himself couldn’t have imagined. I don’t care if I look like an idiot. You try to look away. And then they put it in the box and serve it… still warm. Excuse me if I’m drooling. Eating a Krispy Kreme donut is arguably as delicious an experience as watching it be made. What could be better? You guessed it: eating a free Krispy Kreme donut. Here’s how to celebrate: Buy one dozen donuts, and you’ll get one dozen free Original Glazed Donuts at any participating Krispy Kreme shop in the U.S. or Canada. You may have noticed: We Penny Hoarders aren’t satisfied with just a good price. We won’t settle for any old discount. We know we can always save a little more. When you download the Krispy Kreme Rewards app (for iPhone or Android) and sign up, you’ll receive an offer for a free 1/2 dozen Original Glazed donuts. Download the app early; it’ll take a few hours for the offer to land in your Messages. Also note the offer is available only in select cities, though additional locations continue to be added. Buy a dozen Original Glazed or assorted donuts for $7.99. Use the Day of the Dozens coupon to get one dozen free. Download the Krispy Kreme Rewards app and sign up to receive a coupon for a free half-dozen donuts. Krispy Kreme won’t actually let you combine the BOGO coupon with another offer, so you can’t stack these offers in one order. You could try placing two separate orders, so the cashier will ring up your two dozen donuts separate from your free half-dozen from the app. But I recommend just bringing a friend with you! One of you can download the Krispy Kreme app and claim the free half-dozen. The other can order the BOGO dozens. Split the cost, and you’ve got yourselves some seriously cheap, magically delicious donuts. Speaking of friends, maybe invite some over this weekend. Your 30 donuts aren’t going to eat themselves. Your Turn: Are you a Krispy Kreme fan? Will you claim your free donuts this Saturday? Dana Sitar (@danasitar) is a staff writer at The Penny Hoarder. 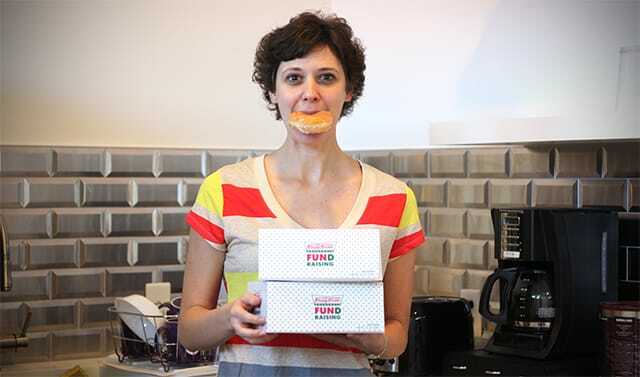 You can see her on Huffington Post, Entrepreneur.com, Writer’s Digest and in a puddle of drool at the Krispy Kreme around the corner from her house.